An Italian poet, journalist, novelist, and dramatist, Gabriele D'Annunzio enjoyed a flamboyant career in international affairs after the First World War when he raised a small army and seized the port of Fiume (now Rijeka, Croatia). Failing in his attempts to annex his territory to Italy, D'Annunzio reigned as Duce over the micro-state for over a year before being forced to relinquish control. The fifteen imprints comprising this collection of scarce broadsides, all printed in the short-lived Free State of Fiume. During the brief period of his reign in Fiume, D'Annunzio issued propagandistic broadsides, proclamations, and leaflets almost daily, often distributing them by airplane drop over the city. Included is a rare first edition of D'Annunzio's most famous piece from the Fiume period, Italia e vita. 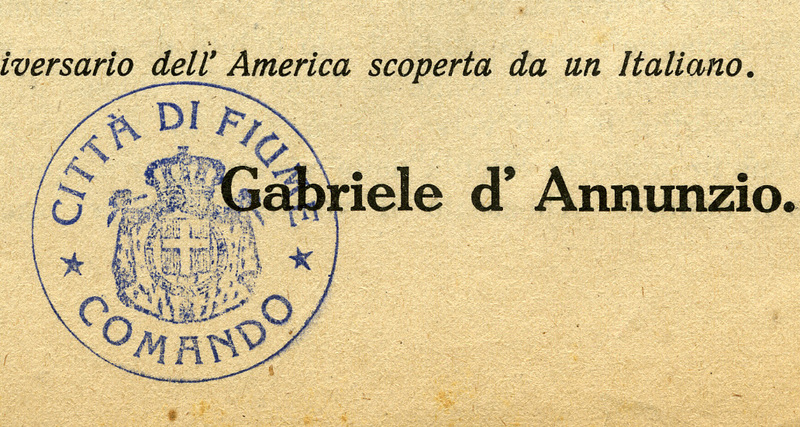 Seal of the city of Fiume. Renowned as a poet and novelist, journalist and dramatist, Gabriele D'Annunzio was considered one of Italy's brightest lights in the last quarter of the nineteenth century. Born into a wealthy family of Dalmatian extraction in Pescaro (Abruzzo) in 1863, he enjoyed a life of intrigue and adventure, earning laurels as a powerful and original writer and dipping into politics while still in his thirties. At the peak of his literary fame during the years immediately preceding the First World War, however, he soon carved out a new role for himself as a hypernationalist and proto-Fascist. Volunteering for wartime service as a fighter pilot, D'Annunzio lived up to his self-proclaimed status as Superman. As a squadron commander, he lost an eye in an accident, but his often outlandish bravado and dramatic gestures were cited as helping to raise the spirits of his fellow Italians during bleak times, winning him a hero's reputation. But that reputation was not sealed until the delicate task of dismembering the Austro-Hungarian empire came to pass after the end of the war, when D'Annunzio's already ardent nationalism was inflamed and he took direct political action. Incensed by the proposed transfer away from Italy of the port of Fiume (now Rijeka, Croatia) at the Paris Peace Conference, D'Annunzio raised a small force of Royal Italian army veterans, nationalists, and irredentists, and on September 12, 1919, seized the city and expelled the allied occupiers. When his plans to annex the territory to Italy were rebuffed, earning a blockade instead, he declared independence and established the Regency of Carnaro (Reggenza Italiana del Carnaro) with himself as Duce. The government formed drew on a mix of anarchist and proto-Fascist ideas, but D'Annunzio's efforts to gain support for this quixotic enterprise were unavailing both internationally and regionally. After the Treaty of Rapallo in November 1920 resolved the dispute between the Italians and Serbs by declaring Fiume a Free State, D'Annunzio declared war on Italy, surrendering only after Fiume was bombarded by the Italian navy in December 1920. Often seen as a harbinger of the Fascism to come in Iatly, D'Annunzio retired to his home after the affair in Fiume, surviving an assassination attempt in 1922. Although never again directly involved in politics, he was lauded by Mussolini and cited as a source and inspiration for the distinctive Fascist style in Italian politics. D'Annunzio died of a stroke in 1938. The fifteen imprints comprising this collection of scarce broadsides, all printed in the short-lived Free State of Fiume. During the brief period of his reign in Fiume, D'Annunzio issued propagandistic broadsides, proclamations, and leaflets almost daily, often distributing them by airplane drop over the city. Included is a rare first edition of D'Annunzio's most famous piece from the Fiume period, Italia e vita, and La Reggenza Italiana del Carnaro, a frame for the new government. Acquired from Stephen Resnick, January 2013. Processed by I. Eliot Wentworth, January 2013. All material in the collection has been scanned and are available online through our digital repository, Credo. Cite as: Gabriele D'Annunzio Collection (MS 763). Special Collections and University Archives, University of Massachusetts Amherst Libraries. Free State of Fiume--History--20th century.